Plenty of bargains in the May book sale! Every year thousands of avid readers and movie & music lovers gather at Central Library for the May book sale. Judging by its past popularity, this sale should be no different. Past buyers have used the sale to find the best book deals, to complete their personal collections or just to rummage and find a gem. And the sale helps our libraries by making room for an ever increasing collection. Highlights of this sale: a great range of non-fiction books, along with the usual range of adult fiction, DVDs, CDs and magazines on every topic imaginable. As at each previous sale, stock is replenished at regular intervals ensuring there are always fresh bargains to be found. And they really are bargains – prices start from 50 cents for magazines, adult fiction, and young adult/teens books with most other items between $1 and $6 and some marked prices. If you love a bargain, you won’t want to miss it. 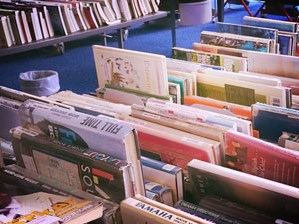 The book sale starts Tuesday 16 May at 9.30am, Central Library.